Love this! Similar to above, adorned with delicate austrian crystal jewelry pins in shape of a BONE. Top insert of card reads: "I like stylish people". More Details+Reg. Price $28.50 $12.00 On Sale, Lucky Dog! It doesn't get any more beautiful than these generously-sized Presentation Cards, adorned with delicate austrian crystal jewelry pins. 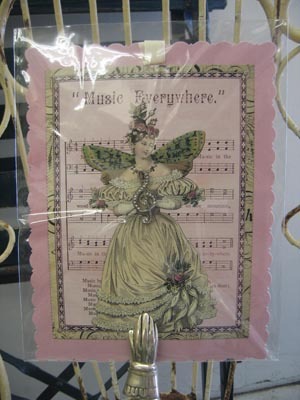 Designed around a collage of antique sheet music, vintage photographs or ancient cookbooks...OH LA LA!!! A bit of silver-colored glitter is hand applied to accent the TREBLE CLEF jewelry pin which can be removed for wearing. Embellished with a ribbon loop, there is ample space for a personal sentiment. Approx 6 3/4 x 8 inches. More Details+Reg. Price $28.50 $19.00 On Sale, Lucky Dog! 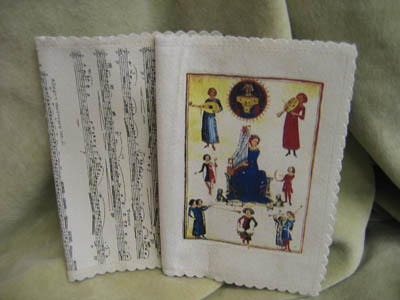 Similar to above, adorned with delicate austrian crystal jewelry pin in shape of CROWN. Woman holds a bouquet of roses. 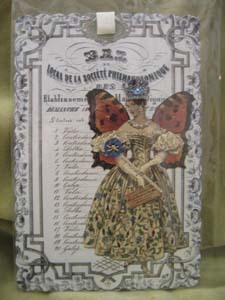 Similar to above, adorned with delicate austrian crystal jewelry pin in shape of blue ROYAL CROWN. 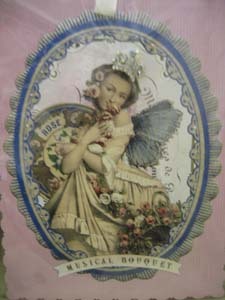 Top banner sign reads "Fairy Queen". Various images of women playing instruments. (Image on right.) Business card size available in this pattern for an additional $30.50 (specify in COMMENTS). 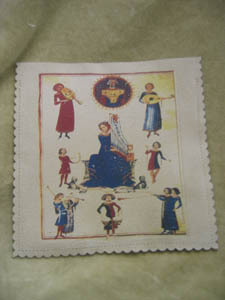 From antique European cloth. 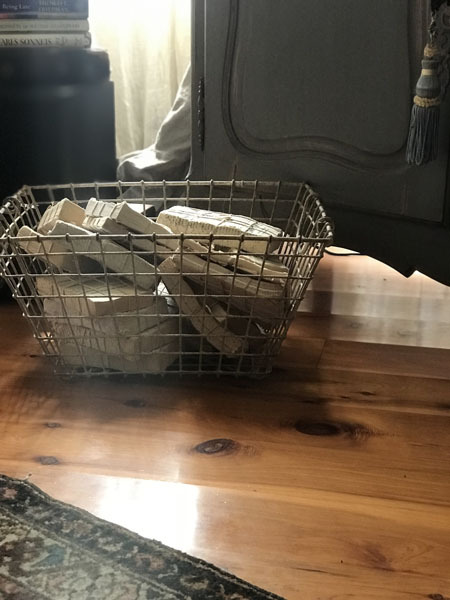 Business card holder available in this pattern for an additional $30.50 (specify in COMMENTS). Chic! 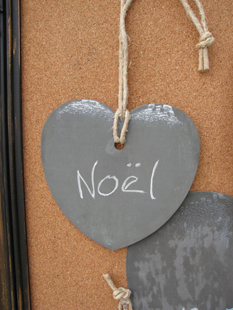 Authentic French Zinc fashioned into the best "chalkboard" you'll ever see! WE LOVE THESE! 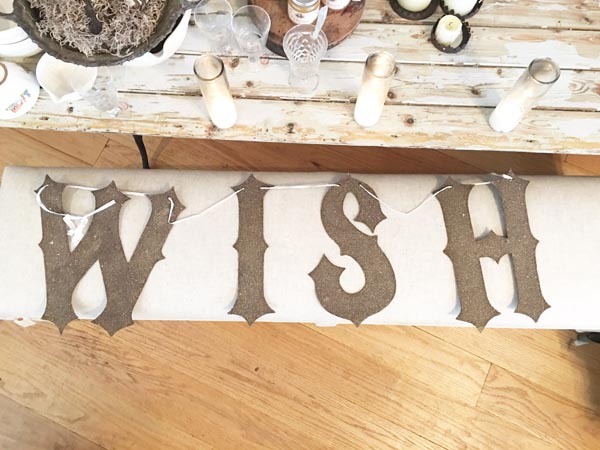 Approx 10 1/2" square, comes with French burlap hanging fabric and one stick of chalk. Imported from Aix an Provence. Chic! 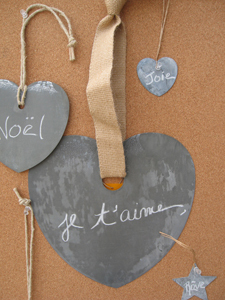 Authentic French Zinc fashioned into the best "chalkboard" you'll ever see! WE LOVE THESE! Approx 7 x6 ", with natural jute string for hanging. Imported from Aix an Provence. Chic! 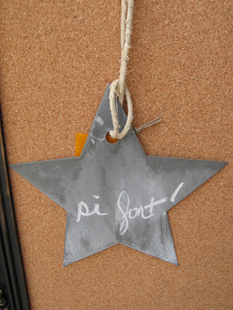 French Zinc Star...ooooh the choices: hang from a package, doorway, corner of a mirror, bulletin board, or dressed to the nines amongst your holiday mantel greenery display! Adorn the stockings unless you don't want to encourage peeking! 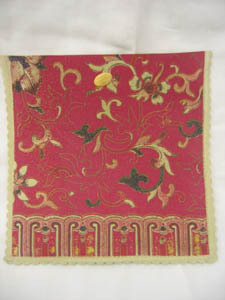 6" square with French jute hanging ribbon. Imported from Aix en Provence. Bag of 6 small zinc stars. Chic! 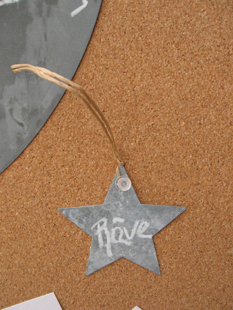 Authentic French Zinc fashioned into the most unique gift tag! WE LOVE THESE! Approx 3" square. Comes with French jute string on each start. Imported from Aix an Provence. Darling cardboard nesting boxes to tuck in the perfect gift or organize an office. Vibrant and gorgeous colors! Set of three in the small set. Box One: 3"H x 4" Diameter; Box Two: 4 x 5; Box Three: 5 x 6". Reg. Price $115.00 $49.00 On Sale, Lucky Dog! Purchased for a line of jewelry and too small for the items! So we're discounting them to you! 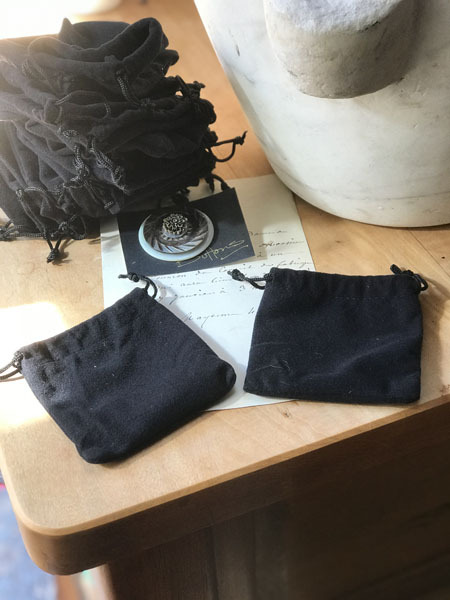 Quantity of 58 unused, new velvet cotton, drawstring bags. Reg. Price $33.00 $23.00 On Sale, Lucky Dog! 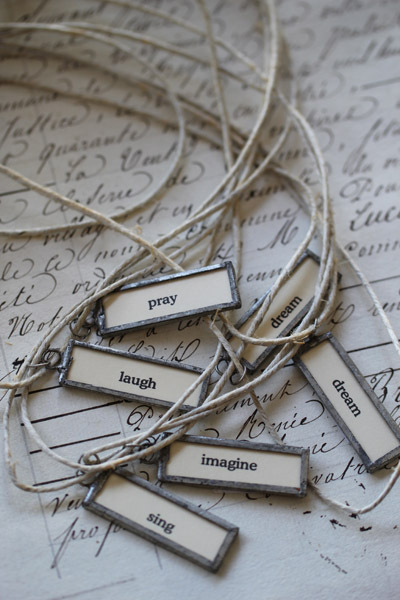 Wonderful words of inspiration to wear as a necklace, attach to a present or wrap around the wrist for a bracelet. The ideas are fueled by your creativity! Tags are 1 1/2" in length on 17" hemp cord. Only those listed below are available. Dated October 21, 1893. 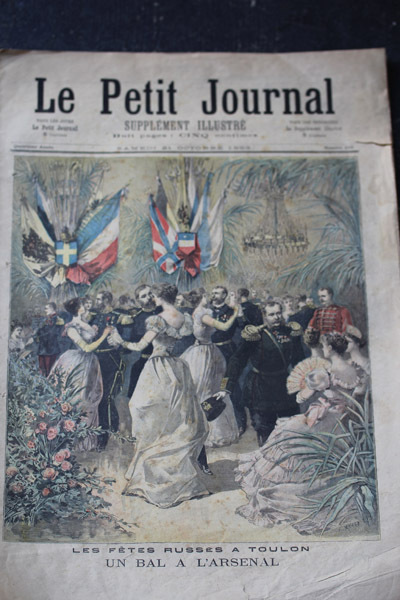 Actual newspaper publication "Le Petit Journal" 6 pages with color images on front and back ideal for framing; interior b/w pages ideal for scrapbooking and craft projects. Shown front image only. Newprint paper. Only one available. Measures 17 1/2 x 12". France, circa 1890's. 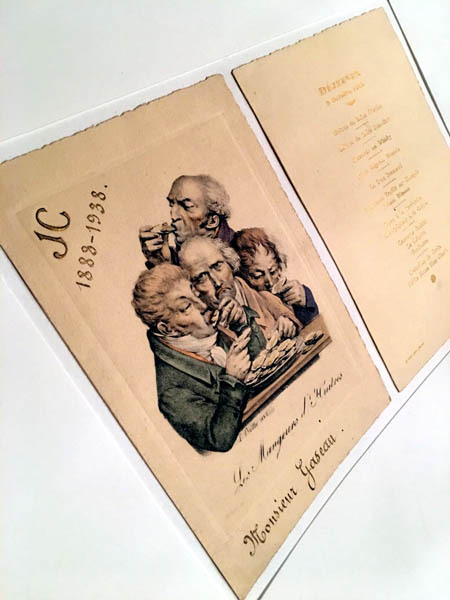 Original handwritten French Menu | Dated: 9 October 1928, 50th Anniversay f�te | Paris Size: 16 x 20"; off white card stock mounting. Actual menu, not a reprint. Mounted, ready for framing. Ships flat. 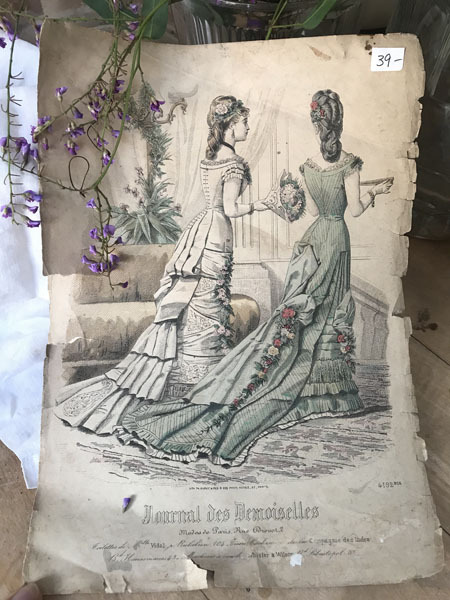 Beautiful flea market find with wearing and tearing indicative of age. Paris, circa early 1930's. 11 x 8". One available. Frameless. Reg. Price $39.00 $24.00 On Sale, Lucky Dog! Reg. 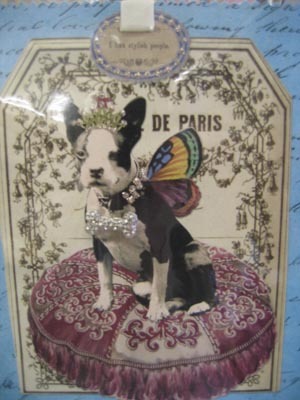 Price $200.00 $95.00 On Sale, Lucky Dog! Each set contains 7 flash cards so you are purchasing a total of 21 individual cards (3 sets). Some have water stains which adds to the patina. French on one side, English on the other. Cards measure 3 1/2 x 1 1/2". Vintage. 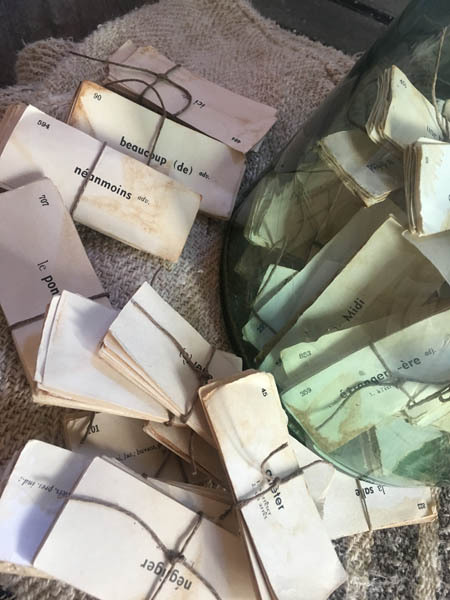 Discovered in a Paris flea market. 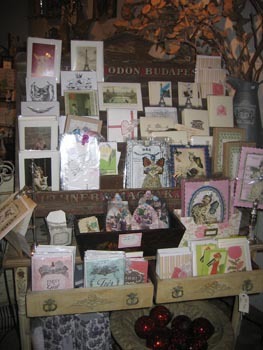 Due to enormous quantity we can not accommodate special words requests but shall pick out cards at random. Merci! 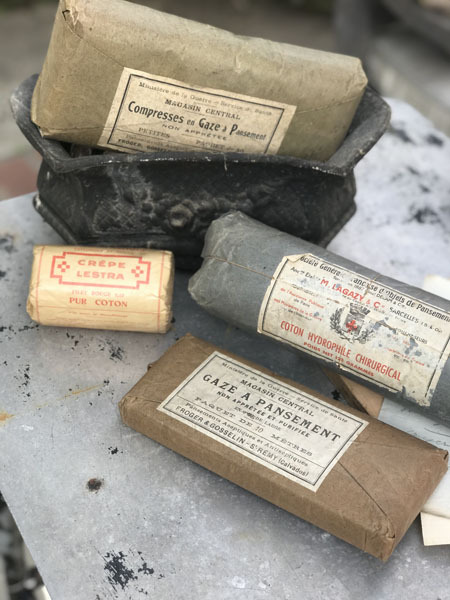 Extremely rare set of four packaged gauze and bandage packages all in original condition. Very good condition. Such a unique set for behind a bathroom cabinet. As the paper is old, it's recommended behind a glass cabinet to preserve longevity. One of the rarest sets we've come across in all of our travels. Largest measures 8" L. France, circa early 1930's. Reg. Price $275.00 $140.00 On Sale, Lucky Dog!